That said. . .after a solid opening half, DC seems to have started feeling the heat because the back half of Lobo takes a big swerve into crossover hell AND tried to shift the character back toward what fans were expecting. In other words. . .it doesn't end well. Let's take a look! 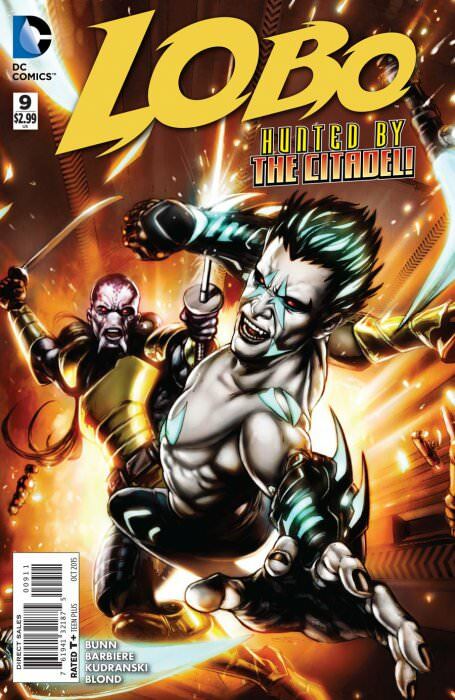 While on a mission for Void Whisper to take out an informer, Lobo is attacked by mind-controlled assassins. Tracking the source of the devices used to control them, Lobo is captured by a deadly rival and enslaved by one of the devices himself. As Lobo continues to work for Void Whisper in trade for information, the story remains interesting and extremely readable. This time out, we see him infiltrating a lavish party, only to almost immediately get captured and turned into a mind-controlled slave with a nice bit of squeamish body horror as he is infected by a spider-like parasite that squirms around just under the surface of his face. There's a very nice mix of action and intrigue in this issue. It's almost laughable how badly Lobo fails at stealth. . .but in a good way. Overall, this issue is one of the better ones of the run, with an ending that makes me want to jump right into the next one. With the unexpected help of Citadel operative Wyvern Cross, Lobo manages to escape being a mind-controlled slave and take down his target. Afterwards, he receives his next assignment. . .Sinestro. A very nice ending to Lobo's current assignment, with some extremely creepy panels filled with spiders crawling over him and burrowing into his skin. WARNING: If you don't like spiders, DO NOT read this issue! There are spiders every-friggin-where. Excessive spiders aside, this is a really good issue. The writing is interesting enough to keep it from falling into a "Get assignment, finish assignment" two issue formula rut, and the art remains very strong. Overall, a great ending to another good two-issue arc. 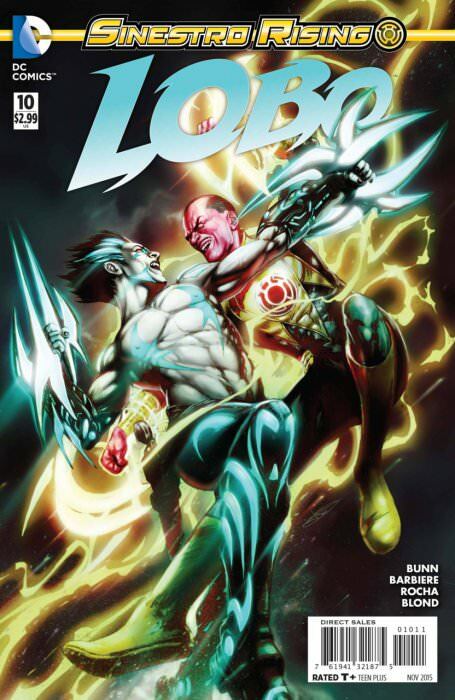 Unfortunately, it looks like another crossover is on the way with Lobo's next assignment being Yellow Lantern Sinestro. Hopefully it works out better than the weak Superman issue. Lobo tracks Sinestro to his hidden base, but discovers that the leader of the Yellow Lanterns put a kill contract out on himself in order to test Lobo. I was happy to see that this crossover issue turned out a LOT better than the Superman issue. I'm not a fan of the Green Lantern series of books and stuff related to it like Sinestro, but found myself enjoying this issue quite a bit. I especially liked the twist that Sinestro took out a contract on himself in order to draw out and test Lobo for his own purposes. There's a different artist at work here as well, and probably one of the best that I've seen yet on Lobo. His work is highly-detailed and every panel invites the eye to linger. He draws Lobo a bit more feral than previous artists, but the quality of his work doesn't make me mind a bit. Overall, this annual is one of the best issues of the whole series in terms of both art and writing. A very pleasant surprise. With Lobo now working for Sinestro and collecting power rings across the galaxy, he is given his toughest assignment yet. . .take down the Red Lanterns. I guess it's official. Lobo has become a Green Lantern spinoff book. After establishing the new status quo in the Annual issue, this regular issue is all Lanterns. Worse. . .although the art remains extremely strong, the sleek assassin Lobo has been replaced by a bulkier, more feral rendering with a wild mane of hair, a bare chest, and a fraggin' skull belt buckle. Yeah. . .it seems that in an effort to backpedal from fan backlash, DC has taken a sudden swerve with this character, trying to hang him on the Green Lantern hook and get him back to the more "traditional" Lobo. It's sudden, and it's pretty disappointing that DC couldn't stick to their guns with the new "Sci-Fi Jonah Hex" character they created. Lobo battles his way through the stronghold of the Red Lanterns as he brutally fulfills his contract with Sinestro to take them down. . . 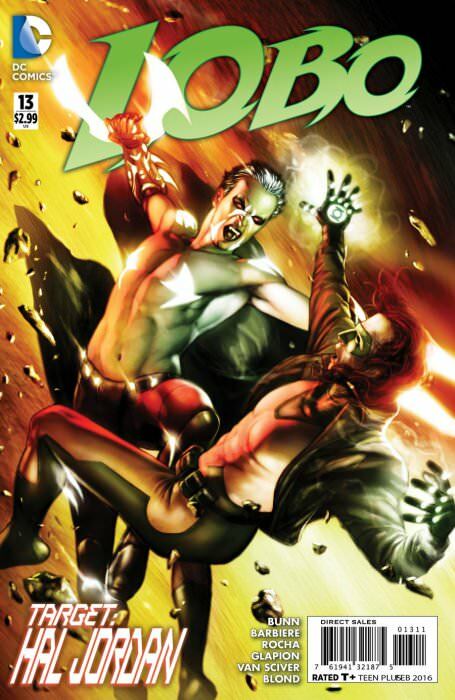 This issue is pretty much all fighting as the new, more brutal and feral Lobo fights his way through the Red Lanterns. The art is the only star of this one. It's simply amazing in places, but it's in service to a pretty mindless story. Overall. . .if I wanted to read a Green Lantern book, I'd read a goddamn Green Lantern book. During an assignment gone wrong, Lobo breathes in some sort of poison that causes hallucinations, making him attack his employer and become a hunted man himself. . .
And then all of a sudden. . .the whole Red Lantern/Sinestro thing is gone and we get a story about Lobo taking on a small time assignment killing some drug runners and going a bit insane after accidentally breathing in some of the burning drugs. Overall, I was glad to see things shift away from this being a Green Lantern crossover book. Oh. . .wait. There's Hal Jordan making a last page cameo. Lovely. What we REALLY have here is a contrived piece of filler trying a bit too hard to explain why Lobo isn't a sleek, cold assassin any more and why he's suddenly a shaggy, bulky, brutal brawler now. At least the art is good. In places, it's even great. A damn shame that it serves a story gone REALLY bad. Lobo goes on a drug-fueled rampage that can only be stopped by renegade Green Lantern Hal Jordan. 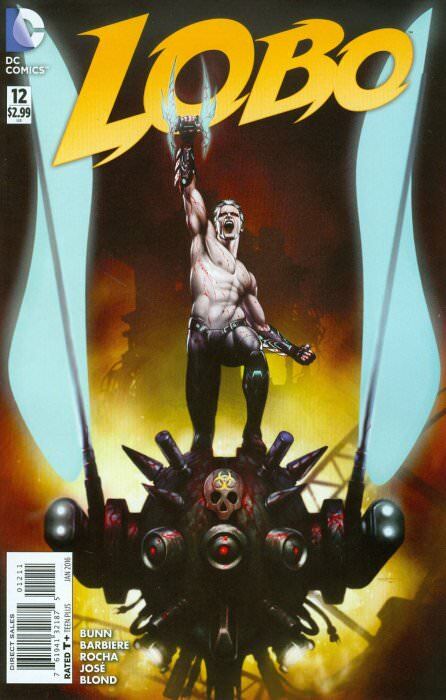 And finally we come to the end of things for New 52 Lobo's regular series. Unfortunately, it's not a very good ending. It's not really an ending at all, to tell the truth. After a brutal battle with Hal Jordan that ends with Jordan dropping Lobo from orbit and almost burning him to death on re-entry, Lobo is saved by Wyvern Cross and told he'll be given refuge at the Citadel. . .but Lobo kills him instead and the comic (and series) just. . .ends. First off, this comic references events in Green Lantern Annual AND Omega Men. . .so crossover hell right there for those wanting the whole story. THEN it doesn't even end Lobo in Lobo's own comic! There's a blurb at the end telling me to check out Batman/Superman #29! I did, and it has NOTHING to do with the end of this issue. What I'm trying to say is that, as the end of a series, Lobo failed pretty badly. You have to read THREE other comics to get the story and even if you do, there's not a real ending in there. A sad ending to what started out as a pretty good series. A damn shame is what it really is. Lobo from the beginning of the series. . .
And Lobo from the end of the series. . . In the short space of 14 issues, Lobo went from an entirely new character. . .a slick killer for hire with a tragic past reminiscent of a Sci-Fi Jonah Hex in many ways. . .to a feral brawler with a bare chest, shaggy hair and fraggin' skull belt buckle. 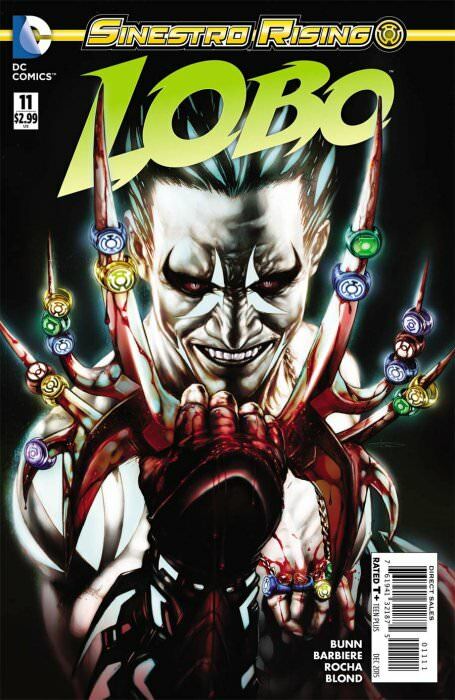 Not only that, but after issue 9, Lobo pretty much turned into a Green Lantern crossover book. The art remained consistently good from the first issue to the last (except for the God-Awful rendering of Superman early on), but the story started to swing in the wind after 9 issues to the point that without reading other comics, Lobo became almost unreadable. Overall, I'd say that this series is a perfect example of a company not standing behind their decisions. 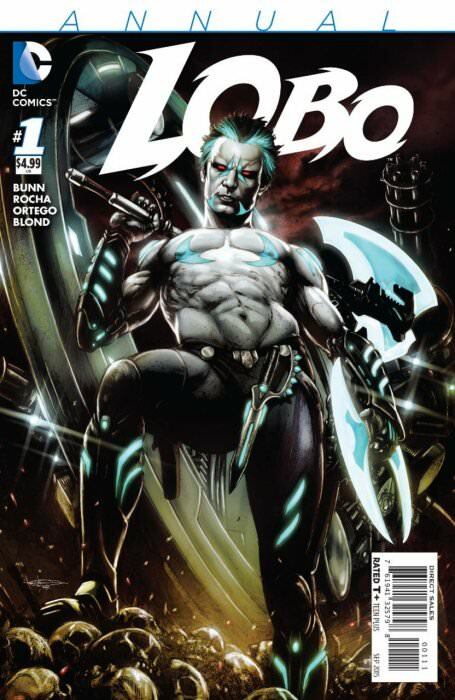 DC made a mistake in calling this character Lobo in the first place, but they utterly failed in trying to keep the character IN character and let it become its own thing. Instead, they buckled under pressure and failed at the backpedal as well. It's a damn shame, because this character was pretty interesting. Like I said. . .a bit derivative of Jonah Hex, but the series COULD have been a fun Sci-Fi Western comic if only DC hadn't tried to hang the character on the Lobo hook. All I can say is just what I said before: Read this without thinking "This ain't Lobo!" and you get a pretty good Sci-Fi Western. . .at first. Unless you're a Green Lantern fan, just stop at the Annual. Everything after that is crossover hell and the "Ending" is probably one of the weakest I've seen for an ongoing series. What happens when there's a Terminator in town and nobody from the future around to 'splain just what the HELL is going on? Find out in Dark Horse's "Terminator: Enemy of My Enemy" 6 issue mini.